and I like my Timmy's. 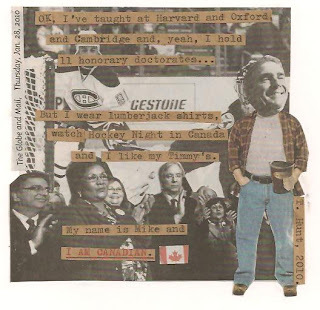 Collage #37 of my Globe and Mail Project: deconstructing Canada's National Newspaper and putting it back together to try and make sense of the world. All images used in this collage were clipped from today's Globe. You know, if the Liberals were smart they might actually do this, but they'd have to get a stand in, some kind of Ignatieff stunt double to pull this off. I don't think the real Ignatieff indulges in make-believe somehow. He is a bit stiff.He could use a few beers to losen him up.